CPM has been involved with charities for a number of years, every year our teams hold a variety of fundraising event to help causes dear to them. This year we decided to have an official company charity and focus the donations so they can do the most good. It’s not an easy task to choose between so many charities and their amazing work, but after much thought and consideration, Briainwave was chosen as CPM’s official charity. In 2012 Brainwave celebrated its 30th anniversary with a clear and simple vision for the future; to continue to positively impact on and support the lives of children and their families with special needs across the UK and Ireland at their three Centers and satellite clinics in Scotland. 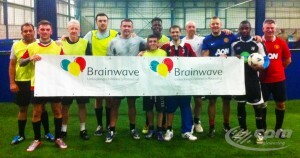 We feel Brainwave do excellent work and this year we are on course to top £5000 in donations. We would like to thank all our customers for making our business successful and therefore allowing us make these donations. We would also like to congratulate CPM’s staff members that demonstrated their support to our chosen charity, with their individual and group initiatives, such as the fundraising football match last week. One of our teams had an unfair advantage with a professional footballer, but in the end they’re all winners: they were all playing for the same cause! And that’s our Christmas spirit..
We wish you a very Merry Christmas and all the best for 2015! "Very good service and a quick turnaround. Until working with CPM we used to buy new, I wouldn't go back now! In addition to making huge savings which we can pass to our customer, retaining our competitive edge, we also save ourselves time and money and the fast turnaround and ability to hold back up stock reduces customers downtime."